Zermatt is most noted for the remarkable Matterhorn, the 14,692′ peak on every Swiss postcard. But families love Zermatt for more than just the splendid mountain scenery. Zermatt’s extensive ski village reached only by train, the extraordinary alpine skiing on four separate ski regions, and the delightful Swiss mountain chalets serving lunch, make the perfect Swiss family ski holiday. We recommend you save Zermatt for an age when your children can truly enjoy all that Zermatt offers, from the vast high elevation terrain- up to 12,791′, 53 ski lifts, and the big ski village. The village of Zermatt is size-able and bustling, while there are technically no cars, there are a plethora of electric shuttles, taxis and buses transporting skiers, workers and visitors. In this magnificent region, you are surrounded by 29 peaks towering over 13,000′ but the Matterhorn wins the prize as most photographed. Zermatt has over 120 hotels, from five star full-service luxury ski hotels to family friendly condo style apartments and chalets. Après ski and evening fun include warm drinks by the fire, sledding and horse drawn sleigh rides and delicious dinners of French, Swiss and German specialties. Here the language is Swiss German, but most everyone also speaks French, many speak English, and a few Italian. Signage includes all four, but trails signs are limited (just numbers and sticks along the side of the prepared slopes), so be sure to keep a trail map on you at all times. Zermatt’s ski tradition is legendary, dating back to 1928 off the original Gornergrat train, and officially as a ski resort in 1942. The legendary Matterhorn looms large above town, making for that perfect family photo, but that is not where the skiing takes place. Your kids will love riding the Gorngergrat ski train – a half hour ride up to the 9,267′ peak where there is a summit hotel, restaurant and observatory for star gazing. On your long run down, you can stop at Zermatt’s Igloo village, how cool is that? We don’t suggest you spend the night there, stay in town at a warm family friendly ski hotel instead, like the four star Hotel Alex. Zermatt’s Sunnegga Rothorn ski region is accessed via funicular, followed by a gondola to Blauherd chondola then a cable car to the Rothorn summit of 9,309′. The Schwarzsee region, the southern part of Zermatt, brings skiers all the way up to the Klein Matterhorn via Gondola followed by the highest cable car in the world – to 12,791′ – not for toddlers or the timid – this is a serious summit! 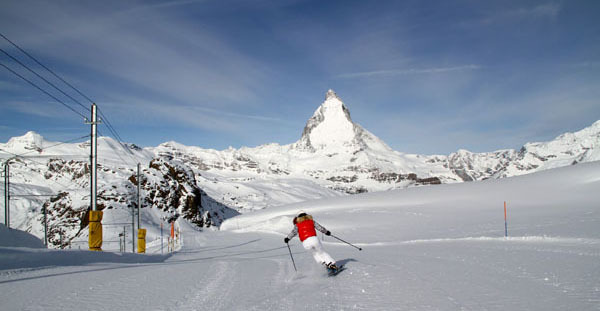 From atop the Klein Matterhorn you can ski an 8 mile long track back to Zermatt village and 7,477′ below. Or you can ski across the Plateau Rosa to Italy and Cervinia – no passports required, just strong ski legs and preferably a clear blue sky day. Be sure to catch the lift back before the lifts close or you are SII – stuck in Italy. The Matterhorn dominates the sky line, you can tell your children the legends of the 450 hikers that have died trying to hike the steep jagged peak, there is even a cemetery of Matterhorn hikers. You can dine on Swiss cheese fondue at the Whymperstube, named for the first successful hiker in 1865. the ski slopes of Zermatt are long and lifts are open from early to late. Zermatt boasts the longest ski season in the Alps from late November to the start of May – with glacier skiing through summer. Christmas and Easter ski holidays in Zermatt are very popular with families, there is plenty of ski terrain and lifts to handle the peak season, although trails and ski schools can be busy. Kids ski free at Zermatt, ages 9 and under with parents who’ve purchased tickets with the Bambini ski pass. Kids will love Wooli the fleecy big horn sheep mascot that skis around the children’s lesson village. Zermatt Ski Stats: 12,791′ Summit, Vertical drop: 7,477′, 53 Lifts, Prepared Trails/Pistes: 153 miles, glacier skiing and more terrain interconnected to Cervinia, Italy. Hire a guide/bergfuherer to explore 1,000s of acres of off-piste terrain. Travel to Zermatt: Fly into Zurich or Geneva, take a Train to Visp then the final scenic hour plus train to Zermatt on the St Bernard Express.